of printing conforming to any type of specifications in film to screen developments. It has flat-bed and cylinder-bed as well as rotary printing machines. 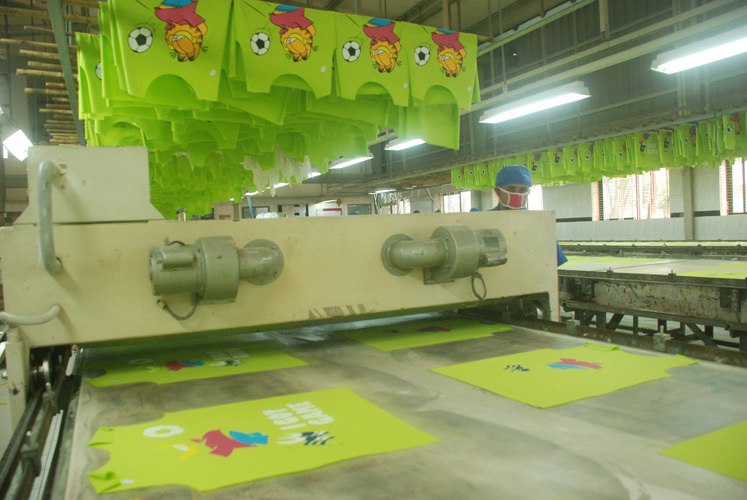 It can apply Pigment, Rubber, Discharge, Flock, Foil, Photo, High Density, Reactive, Emboss, Puff, Burnout, Tie-dye, Stone & Stud, Heat Transfer and several other printing techniques. Its Germany origin Hebbecker Automatic Printing machines render results in an assortment of 12 colors together. This facility can print about 60,000 pieces of apparel every day. Start your career with us ! Are you looking for a challenging, exciting, and rewarding career in the textil industry? Are you an industrious, dedicated individual willing to work with a quality team of professionals? If your answer is yes, then Robintex-Group would like you to join our growing team. We recognize that people are the company. Over the past 25 years the success of Robintex-Group can be attributed to the expertise, dedication, and diversity of talented personnel. We offer a team environment that encourages open communication, respect and recognition, while providing employees the opportunity to grow with us. © 2012 Robintex-Group. All rights reserved. Own Webdesign.